February 20, 2010 Dan O. Reason why I don’t take pills, or trust guys that wear sunglasses indoors. 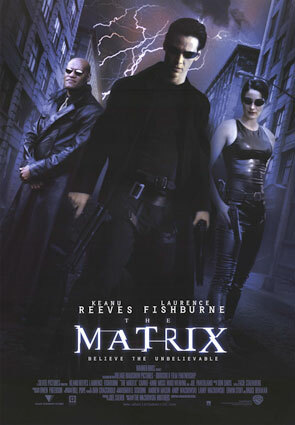 In this complex story that aspires to mythology, a computer hacker (Keanu Reeves) searches for the truth behind the mysterious force known as the Matrix. He finds his answer with a group of strangers led by the charismatic Morpheus (Laurence Fishburne). This movie is someting of a sci-fi classic. It features so many great special effects that look so unreal at points that you don’t even know how they did it, even until this day. The Wachowski Brothers really make something extraordinary here by blending all these different kinds of gneres together. There is all this cyber-punk stuff going down, mixed with Bruce Lee kung-fu action fighting, and a little bit of noir mixed with a scene of spaghetti western here. The way that the special effects are used are so beautiful in the way they look. Wachowski Brothers pretty much just use about anything from models, to cuts, to name well they used it and all of basically works here. I mean they took almost every 20th century sc-fi material they could get and just make such a run for it, its wonderful. The Wachowski Brothers make a very good attempt at saying something that we have seen many times before, but never like this. That is if reality is just something we are living in our minds and if so how do we run away from the dream to make it real. I give them major props for trying to say something here but it’s kind of a let-down with its story and pay-off. That’s why sometimes I felt the script could have been so much better than what it actually was, because so many bad lines are thrown out, I just had to laugh at times. The action scenes in this are highly exceptional and were probably the best parts of the film. The fight scenes are filmed in such a way with stunts that happen so out there that even though there hard to believe there still very awesome. Wachowski Brothers film the scenes by using all these different cuts and showing the action as it happens rather than just having one scene and go back and forth to another. Say what you will about Keanu and how much of a terrible actor he is, but he was born to play Neo. He is so cheesy with his confused act and ultra-cheesy one liners that its hard not to see him as The Chosen One, cause he handles it so well. Laurence Fishburne here is great as Morpheus as the one leader who never loses his patience and mind no matter how much crap is going down. Hugo Weaving gives a very sinister performance here as Agent Smith who is engagingly odd, and plays one of the best and most unusual villains of all-time. Consensus: The Matrix has all the great things a sc-fi film needs with beautiful cinematography, awesome and exciting action, and good performances from the cast, even if the screenplay does seem a bit of a let down. Such a great Science-Fiction film. I remember watching this for the first time and I was completely blown away by the story and the special effects. I only wish that the Wachowski Brothers put the the same level of quality into the sequels (Reloaded and Revolutions). best movie of all time. just as good as blade runner and total recall. tron legacy was a lot like that and it was good too as well as fight club. in my opinion matrix was better than inception.